A friend who builds high-end furniture for a living told me this weekend that it's entirely possible to make a small fortune in woodworking. The trick is to start with a large fortune. The class and seminars I signed up for at the show were all taught by Garrett Hack, an exceptional furniture maker and author. At right are are some of the inlay patterns he makes and applies to his furniture, which was the topic of one of the seminars. In another seminar, he talked about different ways to bend wood, but I had broken my camera by that time (I have a habit of dropping it) so no photos. 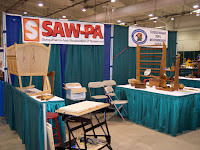 Next is a photo of our club's booth as we're setting up. I demo'd lettercarving for several hours on Saturday. The bottom photo is a guy from the scrollsaw club working on an antique treadle scroll saw. He told me it runs on ham and eggs.